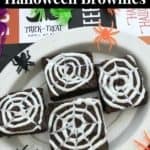 These easy Spider Web Brownies make a fun Halloween dessert. Preheat the oven to 350 degrees and line an 8x8 baking dish with parchment paper or foil (if you using foil, spray with non-stick cooking spray). Combine the brownie mix and ingredients. Pour the brownie batter into the baking dish and bake for 45-50 minutes. Insert a toothpick in the center of the brownies around 45 minutes, if it comes out clean the brownies are done. Once cool, cut the brownies into 9 squares. Scoop the frosting into a microwave safe dish and heat for about 10 seconds. Fill the small sandwich baggy about 1/2 full with vanilla frosting. Use the kitchen scissors to snip one corner. Starting at the center of each brownie, gently squeeze the sandwich baggy and make a spiral with the frosting. Use the toothpicks to drag the frosting from the center to the outer edges of the brownie.